Consider Microsoft Office 365 as a door that is open to organizations of all sizes to take advantage of enterprise-caliber productivity applications, social computing, and unified communications. And all these advantages happen without being trapped behind a firewall or constrained by the cost of implementation and maintenance as in the last decade. The familiar user interface that spans across the Office suite (Outlook, Word, Excel, and PowerPoint) is also present in its cloud cousin, Office Web Apps. With web apps, you can view and edit documents in high fidelity by using these supported browsers: Internet Explorer, Firefox, and Safari. With Outlook Web App, you can access your e-mail, calendar, contacts, and tasks from most browsers. Windows Phone, Nokia, Android, iPhone, and BlackBerry smartphones can access your e-mail, calendar, contacts, and SharePoint sites through your wireless provider’s network or a Wi-Fi connection. SharePoint Online allows you to create, collaborate, and share large, hard-to-e-mail files in a password-protected portal with team members within or outside your organization. You can coauthor documents with colleagues and simultaneously edit documents online to see real-time updates of the changes being made by your coauthors. Lync gives you the ability to conduct planned or ad hoc meetings online. Meeting participants can share high-definition audio and video with supported hardware, share their screen or program, whiteboard, do a quick poll, and conduct a PowerPoint presentation. From either the Outlook Web App or the Outlook desktop client, share your calendar with team members, business partners, clients, and customers. If you subscribe to the Enterprise plan, you can share critical business intelligence, such as Access databases. 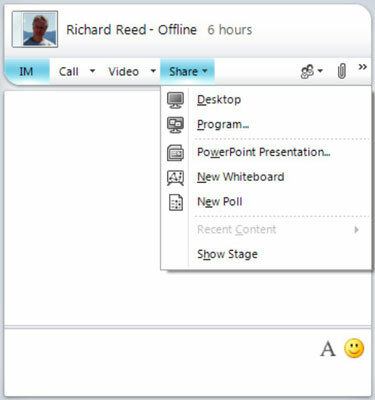 Presence information in Lync shortens the time it takes to connect with colleagues, partners, and customers. The rich presence indicator gives you real-time status of someone’s availability. If you see someone in green, you can immediately start instant messaging or make PC-to-PC voice and video calls.